Strength and organization of the Russian Armed Forces in 1939. Russian infantry with BT-7 tank during the Mongolian fighting against Japan in 1939. During 1939-40, the Red Army were undergoing a period of transition. New weapons and tactical ideas were being developed, but misguided and often stultifying central control meant that there was little sense of initiative or responsibility, and important advances in any sphere were often left in isolation. The excellent progress made in tank construction, for instance, was counterbalanced by the absence of an effective radio-communication system, without which tanks were severely restricted. The Soviet Union placed great reliance on cavalry because of vast distances, poor road and rail communications and the inability of Soviet industry to provide vehicles for all of such a huge army. The Soviet Union was divided into 13 military districts and 2 military commissariats. The Army was essentially a standing army which was run by professional cadre, but it relied on conscription for the mass of its personnel. Men were liable for military service for a period of 22 years from the age of 20 to 41. The peacetime strength of the army was estimated at 1,800,000 men, while mobilised strength could be as high as 11,000,000. The baleful influence of Stalin over the Soviet armed forces during the 1930s culminated in the purges of 1938 which decimated the officer corps. Almost inevitably, the most able and outspoken officers were destroyed by the purges and this was a significant factor in the poor performance of the Red Army in the Winter War against Finland in 1939. It has been estimated that Russian casualties were about 200,000 men during this short campaign. Total men 19,000 ? ? ? Machine guns 417 (174 heavy 7.62mm Maxim, 243 light 7.62mm DT's) ? ? ? Mortars 100+ (50 to 120mm) ? ? ? Anti-tank guns 72 (45mm) ? ? ? 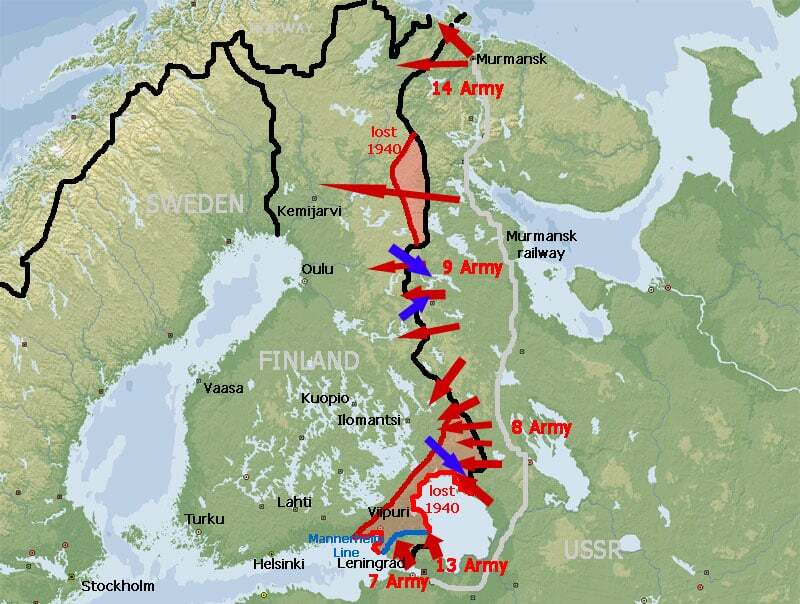 The Winter War with Russian attacks, Finnish counter attacks and territory lost by Finland after the peace of 1940. Tagged 1939, red army, russia.